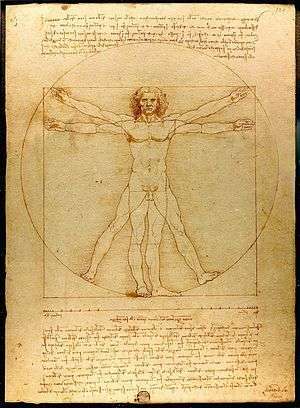 Leonardo da Vinci's Vitruvian Man (c. 1490) shows the correlations of ideal human proportions with geometry described by the ancient Roman architect Vitruvius in his De Architectura. Vitruvius described the human figure as being like the principal source of proportion among the Classical orders of architecture. 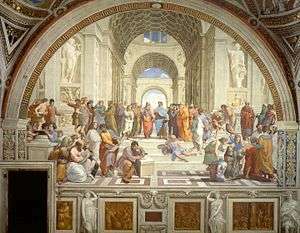 Renaissance humanism is the study of classical antiquity, at first in Italy and then spreading across Western Europe in the 14th, 15th, and 16th centuries. The term Renaissance humanism is contemporary to that period—Renaissance (rinascimento "rebirth") and "humanist" (whence modern humanism; also Renaissance humanism to distinguish it from later developments grouped as humanism). Some of the first humanists were great collectors of antique manuscripts, including Petrarch, Giovanni Boccaccio, Coluccio Salutati, and Poggio Bracciolini. Of the three, Petrarch was dubbed the "Father of Humanism" because of his devotion to Greek and Roman scrolls. Many worked for the organized Church and were in holy orders (like Petrarch), while others were lawyers and chancellors of Italian cities (such as Petrarch's disciple Salutati, the Chancellor of Florence) and thus had access to book copying workshops. In Italy, the humanist educational program won rapid acceptance and, by the mid-fifteenth century, many of the upper classes had received humanist educations, possibly in addition to traditional scholasticist ones. Some of the highest officials of the Church were humanists with the resources to amass important libraries. Such was Cardinal Basilios Bessarion, a convert to the Latin Church from Greek Orthodoxy, who was considered for the papacy and was one of the most learned scholars of his time. There were several fifteenth-century and early sixteenth-century humanist Popes one of whom, Aeneas Silvius Piccolomini (Pius II), was a prolific author and wrote a treatise on "The Education of Boys". These subjects came to be known as the humanities, and the movement which they inspired is shown as humanism. Italian Humanism spread northward to France, Germany, the Low Countries, and England with the adoption of large-scale printing after the end of the era of incunabula (or books printed prior to 1501), and it became associated with the Protestant Reformation. In France, pre-eminent Humanist Guillaume Budé (1467–1540) applied the philological methods of Italian Humanism to the study of antique coinage and to legal history, composing a detailed commentary on Justinian's Code. Budé was a royal absolutist (and not a republican like the early Italian umanisti) who was active in civic life, serving as a diplomat for François I and helping to found the Collège des Lecteurs Royaux (later the Collège de France). Meanwhile, Marguerite de Navarre, the sister of François I, was a poet, novelist, and religious mystic who gathered around her and protected a circle of vernacular poets and writers, including Clément Marot, Pierre de Ronsard, and François Rabelais. Many humanists were churchmen, most notably Pope Pius II (Aeneas Silvius Piccolomini), Sixtus IV, and Leo X, and there was often patronage of humanists by senior church figures. Much humanist effort went into improving the understanding and translations of Biblical and early Christian texts, both before and after the Protestant Reformation, which was greatly influenced by the work of non-Italian, Northern European figures such as Desiderius Erasmus, Jacques Lefèvre d'Étaples, and William Grocyn. Here, one felt no weight of the supernatural pressing on the human mind, demanding homage and allegiance. Humanity—with all its distinct capabilities, talents, worries, problems, possibilities—was the center of interest. It has been said that medieval thinkers philosophized on their knees, but, bolstered by the new studies, they dared to stand up and to rise to full stature. Inevitably, the rediscovery of classical philosophy and science would eventually challenge traditional religious beliefs. Venice began teaching humanist thinking in the early late 14oo. In 1417, for example, Poggio Bracciolini discovered the manuscript of Lucretius, De rerum natura, which had been lost for centuries and which contained an explanation of Epicurean doctrine, though at the time this was not commented on much by Renaissance scholars, who confined themselves to remarks about Lucretius's grammar and syntax. Lorenzo Valla, however, puts a defense of epicureanism in the mouth of one of the interlocutors of one of his dialogues. Valla's defense (or adaptation) of Epicureanism was later taken up in The Epicurean by Erasmus, the "prince of humanists:"
This passage exemplifies the way in which the humanists saw pagan classical works, such as the philosophy of Epicurus, as being in harmony with Christianity when properly interpreted. Renaissance Neo-Platonists such as Marsilio Ficino (whose translations of Plato's works into Latin were still used into the nineteenth century) attempted to reconcile Platonism with Christianity, according to the suggestions of early Church fathers Lactantius and Saint Augustine. In this spirit, Pico della Mirandola attempted to construct a syncretism of all religions (he was not a humanist but an Aristotelian trained in Paris), but his work did not win favor with Church authorities. Though humanists continued to use their scholarship in the service of the church into the middle of the sixteenth century and beyond, the sharply confrontational religious atmosphere following the Protestant reformation resulted in the Counter-Reformation that sought to silence challenges to Catholic theology, with similar efforts among the Protestant churches. However, a number of humanists joined the Reformation movement and took over leadership functions, for example, Philipp Melanchthon, Ulrich Zwingli, John Calvin, and William Tyndale. With the Counter Reformation initiated by the Council of Trent, positions hardened and a strict Catholic orthodoxy based on Scholastic philosophy was imposed, and some humanists, even moderate Catholics such as Erasmus, risked being declared heretics for their criticism of the church. The historian of the Renaissance Sir John Hale cautions against too direct a linkage between Renaissance humanism and modern uses of the term: "Renaissance humanism must be kept free from any hint of either "humanitarianism" or "humanism" in its modern sense of rational, non-religious approach to life ... the word "humanism" will mislead ... if it is seen in opposition to a Christianity its students in the main wished to supplement, not contradict, through their patient excavation of the sources of ancient God-inspired wisdom"
↑ Löffler, Klemens (1910). "Humanism". The Catholic Encyclopedia. VII. New York: Robert Appleton Company. pp. 538–542. ↑ John L. Lepage (5 December 2012). The Revival of Antique Philosophy in the Renaissance. Palgrave Macmillan. p. 111. ISBN 978-1-137-28181-4. ↑ Kreis, Steven (2008). "Renaissance Humanism". Retrieved 2009-03-03. ↑ "Rome Reborn: The Vatican Library & Renaissance Culture: Humanism". The Library of Congress. 2002-07-01. Retrieved 2009-03-03. ↑ "Humanism". Encyclopedic Dictionary of Religion. F–N. Corpus Publications. 1979. p. 1733. ISBN 0-9602572-1-7. Trinkaus, Charles (1973). "Renaissance Idea of the Dignity of Man". In Wiener, Philip P. Dictionary of the History of Ideas. ISBN 0-684-13293-1. Retrieved 2009-12-02.